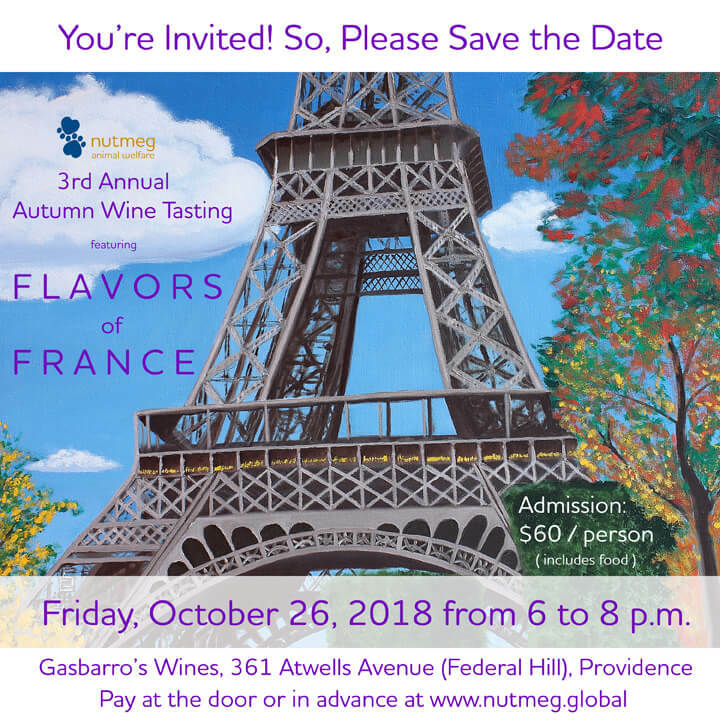 WHO: Nutmeg Animal Welfare, a Rhode Island-based 501(c)(3) nonprofit charity, invites all animal lovers to its third annual Autumn Wine Tasting! Special guests include magician and motivational speaker John Logan (back by popular demand!) and (new this year) members of the 2018 Patriots Cheerleaders squad, who will help present raffle and auction items to winning patrons. WHAT: The evening’s theme –“Flavors of France”– will feature French varieties from across that European nation’s many diverse and historic wine-producing regions, paired with vegetarian delights from Pane e Vino Ristorante & Enoteca. WHEN: Friday, October 26, 2018 from 6 to 8 p.m.
WHY: At least 75 percent of proceeds from the modest admission fee of $60 per person goes directly to relief supplies and welfare services, helping Nutmeg offer short- and long-term comfort for needy animalsaround the world… and around the corner! DETAILS: Holiday season is almost upon us, and with it will come so many holiday parties! As either a guest or a host, you’ll want to make a great impression and get into the “holiday spirit” by gifting or serving great spirits, like fine bottles of wine. Choosing the right one can be a challenge, however, even for experienced oenophiles. For inspiration, Nutmeg welcomes you to join its growing number of loyal supporters for a fun Friday night out on Federal Hill. You’ll get great wine ideasby sipping superior French selections, be mesmerized by John Logan’s eye-popping prestidigitation, and make some new, likeminded friends, all while helping out a noble charitable cause. No one will go home empty-handed, either! Some guests will win valuable raffle and auction prizes (including an NFL football personally autographed by Rob Gronkowski), and everyone will receive peace of mind, knowing that the overwhelming majority of their financial contribution to Nutmeg (a minimum of 75 percent!) will be allocated where it belongs: to the world’s neediest animals, including many here in Rhode Island. In addition, Nutmeg’s founder, Erik Scalavino, promises to keep all donors informed about how and where every last one of their generous dollars is spent, no matter the size of the gift or how long it takes to do so. Click here for scenes from last year’s event!